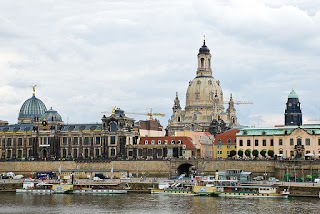 One of the great things about Dresden is its amazing riverfront. 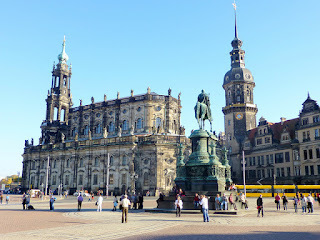 Its classical skyline curves along the Elbe riverside, gracing the old town above the old steamboat docks. 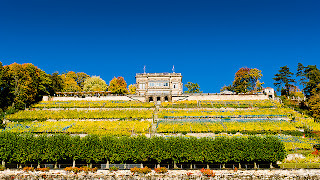 And then there's the green hill lining the other side, dotted by palaces, the slopes terraced by vineyards. There are foot-paths lining both sides of the river, making it simple to run up one side and back along the other. The stretch eastwards from the old town to the Blaues Wunder ("Blue Wonder" bridge in Löschwitz) is the nicest and is the greenest part of the river, and that's what this route follows. NOTE: This is a fairly long route. But, of course, you can cut it short by turning around any time you please. We'll start in the heart of the old town, at the Theaterplatz in front of the Semper Opera House. In this spectacular spot, with the opera, the Zwinger, the castle and the Hofkirche cathedral, is one of the most impressive ensembles of classical architecture you'll find anywhere. Take a good look around you, breathe-in this amazing backdrop, and then off we go. Turn north towards the river just 100 meters away and run past the Hofkirche, built as the protestant city's first Catholic church after Saxon Elector Augustus III became King of Poland. Run to the river and cross the old stone bridge, the Augustusbrücke, running to the new town on the other side. Make sure you take a look back at where you're running from: what a view! At the other side of the bridge, take the steps going down on the right side, past the biergarten. You are now running eastwards on a path going along the river, through a narrow lawn. You have to turn right to continue on the path closer to the water. You'll stay on this path until the turn-around point 7 km later in Löschwitz. 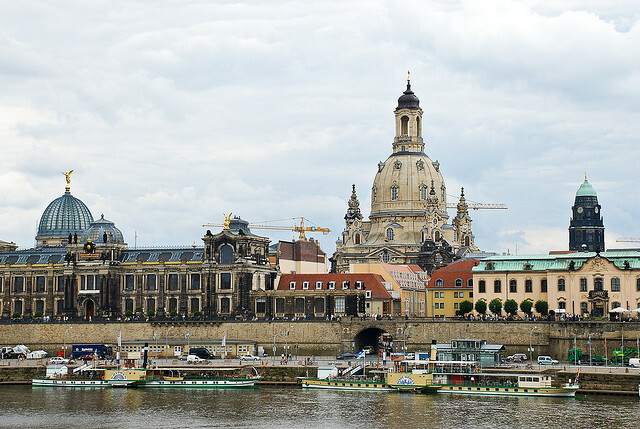 Across the river, to your right, is the beautiful Dresden skyline, dominated by the reconstructed Frauenkirche. 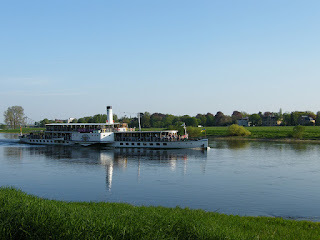 The old steamboats line the riverside, waiting for tourists. To your left is a big old state ministry building, and you'll run straight through a little amphitheater, used for summer events. 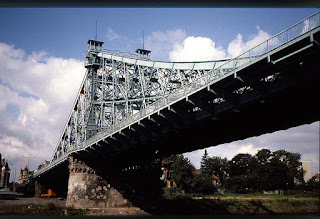 You'll go under three bridges before reaching the Blaues Wunder bridge at the half-way point. The first one, the Carolabrücke, is right in front of your nose. It is a modern, concrete span used by cars, pedestrians and trams. After going under the Carolabrücke, you'll pass another ministry and a small park. And you'll see the next bridge coming up, the stone Albertbrücke. There is a long rose-garden park to your left after the bridge, then, at the 2.5 km mark, you'll come to a ferry landing, but I expect this to close down soon. The reason lies ahead in the brand-new bridge, the Waldschlösschenbrücke. This project was pushed-through by the city despite huge resistance from a wide variety of opponents. 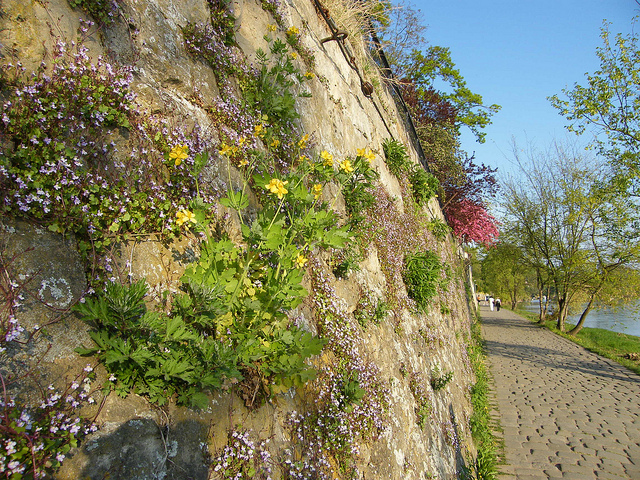 The UNESCO threatened to revoke (and did) the Elbe-valley's World Cultural Site status if the bridge was built in the green valley, surrounded by its palace landscape. Protest groups held up construction for years. But now, in 2013, the bridge is being completed, and soon traffic will be roaring over it. The bridge is held up by a single archway and is fairly elegant in its way. It gets its name from a small hunting palace and brewery up the hill to the left. From now on, after the 3.5 km mark, the bluff along the left will be dotted by villas and palaces, with their gardens and vineyards. Unfortunately, it's hard to see them because of the walls and trees lining the path. But now and then, you'll get a glimpse of the mansions. You'll be able to see them better when you cross the river and return along the other side. Later, the path goes right down to the waterside, with no lawn, and goes by a little harbor at the 5.5 km mark, as you approach the turn-around point at the Blaues Wunder. The trail leaves the water for the last few hundred meters. 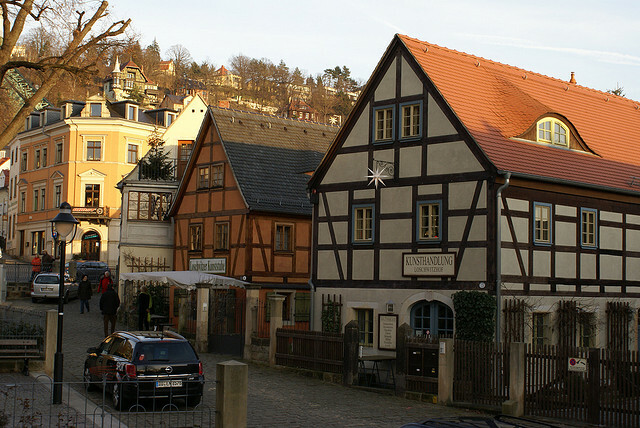 You are now in Löschwitz, a scenic hill-side town full of old houses, villas and even a little cable-car going up the hill. You will come out at the busy street that leads over the bridge. But rather than turning right and heading straight over the bridge, it's worth it to see a bit of this nice village first. So cross the busy street and run down Dammstraße, going downhill. At the round well-house you'll see a line of nice half-timbered houses to the left, worth taking a quick loop to look at. Then head downhill again, past the well. Keep to the right and run past more old houses right down to the river. At the water, turn right and run back to the bridge, taking the steps up to the bridge and cross the river. This is the 7 km point. The return trip is a kilometer shorter. On the far side, take the steps down again and get to the path under the bridge. Now you just turn west and run back along the path all the way back to the start. This time, you'll be able to see the hilltop palaces better, across the river. For most of the way, the south bank has a wide meadow between the path and the town, giving it an open feeling. After you go under the Carolabrücke again, and you head into your last kilometer, you'll run by all the Elbe-tourboat docks, and you'll have the old town on your left. Just run straight back to the Hofkirche and turn left into the Theaterplatz plaza again.